Radcot - Faringdon Community Website. There is now a sequence of three bridges. The original one, built of Taynton stone, over the Thames proper, is the oldest bridge across the Thames, carrying the north-south road from Mercia to Wessex. Named for the nearby hamlet Radcot (the cottage by the road), it was mentioned in the 1086 Domesday Survey as owned by the king and farmed by Alsi of Faringdon as a two family unit of 24 acres. Traces of ridge and furrow are evident on both sides of the road. Important buildings required stone. 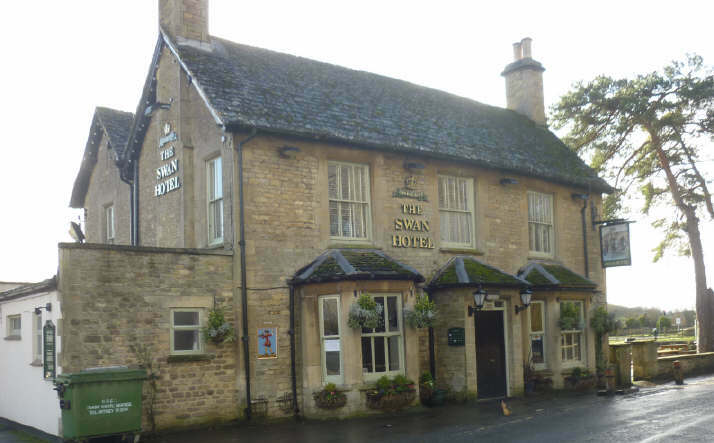 Very good building stone from Taynton and Burford quarries needed cheap transport, by water. The nearest wharf was at Radcot bridge, where wooden wharves made loading to small lighters easy for the unimpeded passage down to Oxford and on to London. Surges in the building trade meant that bigger vessels were needed and a canal was dug, with bigger wharves, which created an island. Two additional stone bridges, Canal Bridge and Pidnell Bridge, were built to take the heavier traffic. 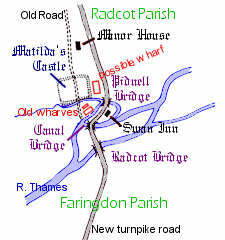 There is plenty of documentary evidence that Radcot Bridge became a toll bridge (the 'pontage' went to the royal treasury) and remained important as the highest shipping point up the Thames. 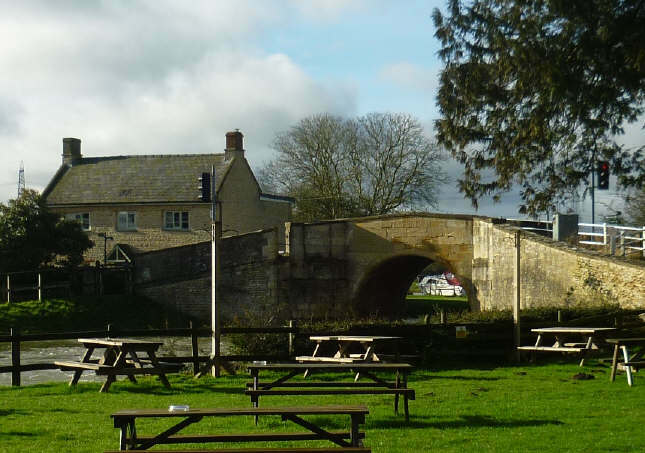 Its commercial importance grew through the junction (1783) of the Severn-Thames canal with the river above Lechlade. The railways and the flood controls in the Thames valley left a trio of awkward road bridges now controlled by traffic lights. "Radcot Bridge" has made history three times. Matilda, Countess of Anjou, campaigning to depose King Stephen, occupied Oxford and in 1141 set up an earthworks "castle" across the main road just north of the bridge; some remains can still be seen north of the Swan Inn. (Pairs of swans still nest in the surrounding meadows. ) Her castle forced passengers to make a detour to the east, the route later adopted by the Faringdon & Burford Turnpike Trust in 1770, now the A4095. In the winter of 1387/88 the rebellious Barons wished to stop reinforcements from the west joining the King Richard II in London. Gloucester, the king's uncle, was required to close the midland routes. 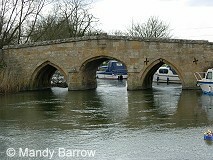 The southern position, under the Earl of Derby [who in 1399 succeeded Richard as Henry IV], was the island between the Radcot bridges. The western reinforcements for the king were marching east to Burford and were obliged to head quickly south. They found that Radcot Bridge was sabotaged, and guarded by Derby's troops, while Gloucester's men were closing in from the north. The king's forces made desperate rushes over or through the river; they lost their two leaders, and were too tired for anything but surrender. Apparently a monument, now lost, was put on the repaired bridge in 1393. More than two centuries later Parliamentarians secured the Radcot bridges during their siege of the Royalist garrison in Faringdon House. A careless manoeuvre allowed the bridges to be taken and a Royalist garrison to be established at Radcot House, a Tudor building just north of the remains of Matilda's Castle. There was a skirmish on the road north in July 1645. Later, Parliamentarians skilfully ambushed royal reinforcements who had rescued an unsuccessful sortie from Radcot House to Lechlade. In spite of substantial losses, the Royalists were not dislodged . In April 1646 Radcot House was invested in preparation for a vigorous assault on 10th May by Parliamentarians, detached from the siege of Oxford. The Royalists surrendered; they were disarmed and allowed to disperse. Six week later that phase of the Civil Wars was over. Based on E.A.Pocock, Radcot and its Bridge, 1966., and other sources.